Standard - €61.99 X-Large - €61.99 Only 3 left! Well, if you have the impeccable style sense of a Force-wielding master and the tenacity of a professional wrestler, then you’re going to feel right at home wearing this Deluxe Supreme Commander Snoke costume. You can use your newfound style to slay The Resistance once for all, or you can just sit on your comfy throne and send ominous messages to Kylo Ren and General Hux. The Star Wars costume comes with a golden robe that exudes both extravagance and simplicity—a difficult combination to come by. It’s quite fitting for anyone trying to become a dark lord bent on controlling a galaxy far, far away. 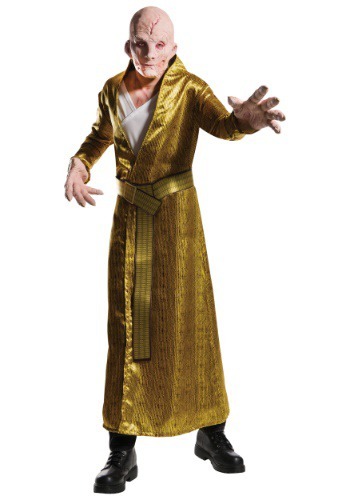 Of course, it also comes with a molded mask designed to look like Snoke’s scarred face. With a look this intense, you won’t even need crazy Force powers or a lightsaber to keep your subordinates in check. Now, your first order of business (get it? ), it will be to crush Luke Skywalker and Rey before they become a true threat to your plans!